One of my favorite football party snacks, and one that I was planning to make for the Superbowl, is buffalo chicken dip. It is basically chicken cooked in buffalo wing sauce and then covered in cream cheese and cheddar cheese eaten with tortilla chips. Very low cal. Ha! 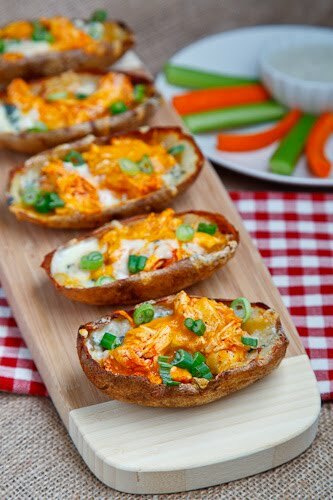 The idea is similar to these yummy looking buffalo chicken stuffed potatoes. Minus the tortilla chips of course. I might have to forgo my beloved dip to try out these spuds. You can get the buffalo chicken stuffed potato recipe over at Closet Cooking. These look fantastic!!! However the link for the potato recipe brings me to a buffalo dip recipe on your site? goodness I so don't care about the super bowl but I may have to whip these up for super munchie sunday!